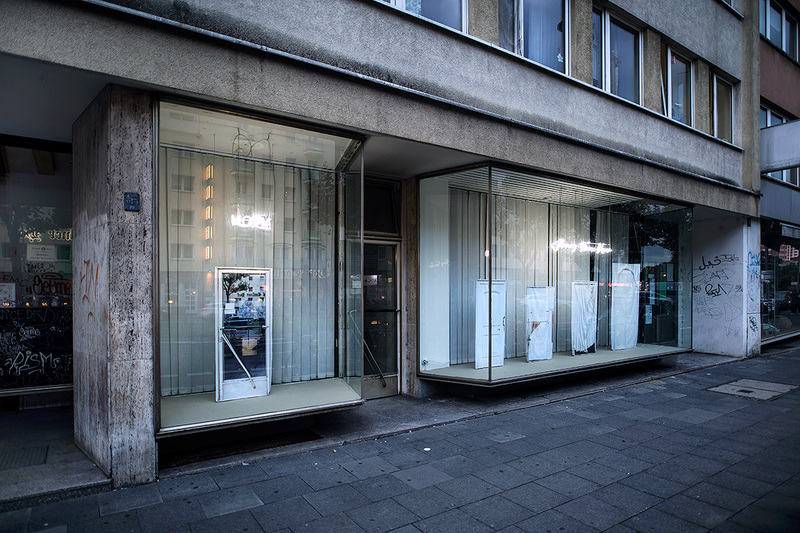 The site specific art installation at Sightfenster is located in the display windows of a temporary home for asylum seekers. Set among neon lights, cotton flags depict fictional entrance and door motifs based on photographs from areas of conflict across the world. The separated single door replicates the manifest glass entrance to the security area of the house. 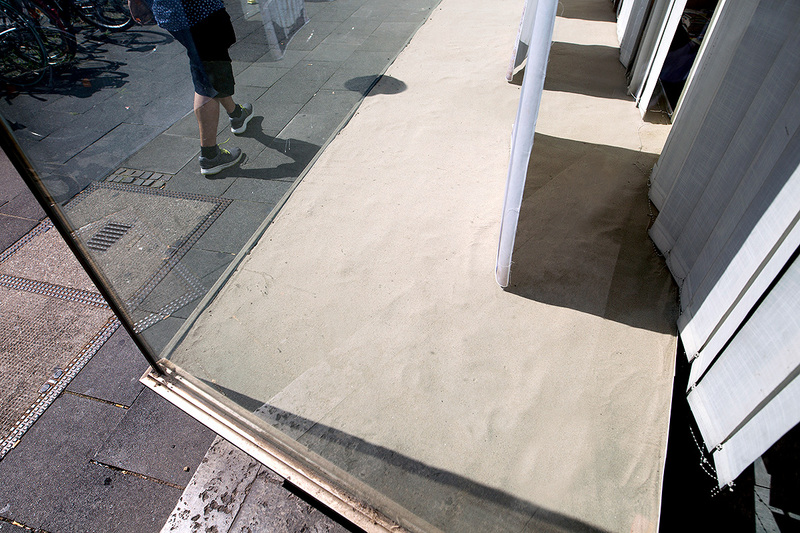 All textile-doors hover barely above the sand, not touching ground. The art work explores flight and migration through the themes of “house” and “home”. A house is the physical manifestation of boundaries between inside and outside – an opening, a doorway joins the two. After a house’s architectural attributes and site specific context, it is the utilization of a house that defines its purpose and meaning, and therefore the impact it has on its inner environment and outer surroundings. Often a door links or separates inside from outside, reveals or hides, allows or prohibits entrance. In the context of a home, a door separates public from private. Symbolically, it divides the known from the unknown, the familiar from the foreign or strange. The indogermanic word stem “dhwer” (door) slowly developed through „dhwor-āns“ (outdoors, outside) into the English word „foreign“. What is our perception of the foreign, the other? What makes a house into a home? What do we assume happens behind others’ doors? What connects us and what divides us? What conditions, expectations and rules – across scales from the personal to the collective, the individual to the political – are attached to opening a house? What do we need to feel at home? يقع العمل الفني الخاص ب(منزل بعيد عن الموطن) وكأنك في بيتك للفنانة ليا سايل على شاشة العرض في سايت فنستر، علي هيئة منزل مؤقت لطالبي اللجوء. ما بين أضواء النيون ترفرف الأعلام القطنية علي هيئة خيالية لأبواب مجمع عليها صور للصراعات من مختلف مناطق العالم. يكشف العمل الفني الهجرة و الطيران من خلال موضوعي “المنزل ” و “الموطن”. و لذلك تم تحديد هذين الجزءين من العمل الفني المحدد و وما الذي يجعل المنزل. سيتم افتتاح (منزل بعيد عن الموطن) يوم الجمعة الحادي عشر من اغسطس من الساعة السابعة الي الساعة عاشرة مساءا، برعاية چاجلا اوستيلونج راوم. مکان کارگزاری و چیدمان ویژه ی هنری HOME AWAY FROM HOME (خانه ای دور از خانه ( توسط هنرمند لیا سایلی نمایشی است درSightfenster ، که در ویترین پنجره های یک خانه ی موقت (پناهگاه) برای پناهجویان قرار دارد. مجموعه ای ساخته شده از نورهای نئون، پرچم هایی از ابریشم و پنبه ، منقوش به ورودی هایی و درهایی ساخته شده با نقوشی متاثر از عکس هایی از مناطق درگیر در سراسر جهان. این اثر هنری، پرواز و مهاجرت را از راه مضمون “خانه” به “خانه” بررسی می کند. Die ortsspezifische Kunstinstallation HOME AWAY FROM HOME der Konzept- und Medienkünstlerin Lia Sáile, gezeigt im Off-Space Sightfenster, ist in einem Übergangswohnheim für Flüchtlinge situiert. DIe Installation ist zusammengesetzt aus Neonlichtern sowie Stofffahnen mit realen und fiktiven Tür-Motiven, die basierend auf Fotoaufnahmen aus verschiedenen Krisengebieten konstruiert wurden. Die Stoff-Türen schweben knapp über dem Sand, den Boden nicht berührend. Die Arbeit reflektiert den spannungsgeladenen Themenkomplex Flucht und Migration auf der nahbaren Ebene des Hauses sowie des Zu-Hauses. Das sprichwörtlich “zweite Zuhause” wird im Englischen als “home away from home”, als Zuhause fern von Zuhause, beschrieben. In vielen Sprachen, beispielsweise im Arabischen منزل, Persischen خانه und Armenischen տուն wird „home“ zunächst als Haus übersetzt. L’installation artistique HOME AWAY FROM HOME (second chez-soi) de l’artiste Lia Sáile, est située dans un foyer temporaire pour réfugiés. 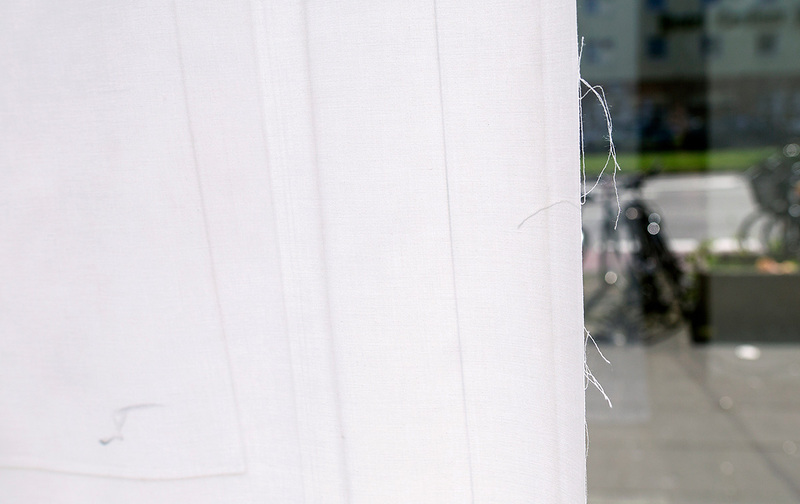 L’installation spécifique à l’endroit, constituée de néons et de motifs de portes fictifs sur de bandes de tissu, résultant de clichés pris dans diverses zones de conflit, reflète la recherche sur le thème de la fuite et la migration sur l’aspect de la maison et du sentiment d’être chez-soi. Qu’est-ce qui fait d’une maison un chez-soi? Quelles représentations nous faisons nous de ce qui se passe derrières les portes des autres? Qu’est-ce qui nous sépare, qu’est-ce qui nous lie? Quelles conditions, attentes ou règles sont liées à l’ouverture d’une maison et ceci au niveau privé et collectif, ainsi qu’au niveau individuel et politique. De quoi avons nous besoin pour se sentir chez soi?